Documents further exposing the depth of corruption and mismanagement of public funds at Nigeria’s Ministry of Aviation headed by Stella Oduah. 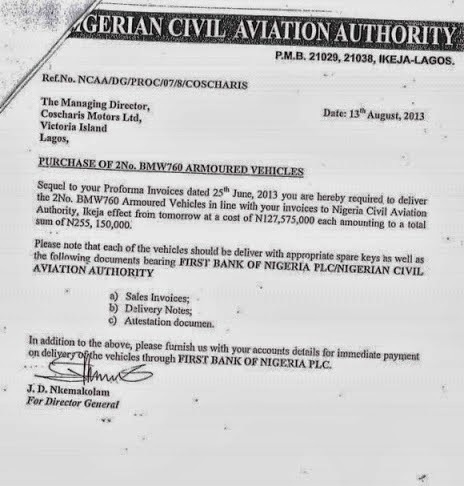 One of the documents details how Ms. Oduah compelled the cash-strapped Nigerian Civil Aviation Authority (NCAA) to purchase two armored BMW cars for the minister emanated into the public through SaharaReporters. NCAA is the agency charged with ensuring the airworthiness of commercial planes flying within Nigeria’s airspace. Two officials of the agency told SaharaReporters that the NCAA did not have enough funds to upgrade equipment, send staff for critical training, and hire enough qualified staff. “Yet, all the minister is concerned about is to have two exotic BMW cars from the little money we have for operations,” one of the sources said. 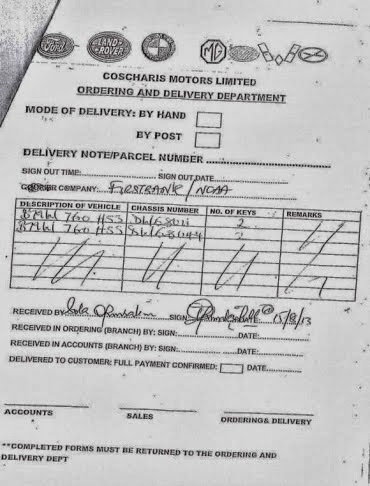 The documents obtained by SaharaReporters indicate that the transaction for the purchase of the two BMW vehicles started in June 2013. However, the request for delivery of and payment for the two vehicles was fast-tracked between August 13 and 15 2013. The transaction involved the NCAA, First Bank of Nigeria, and Coscharis Motors Limited. 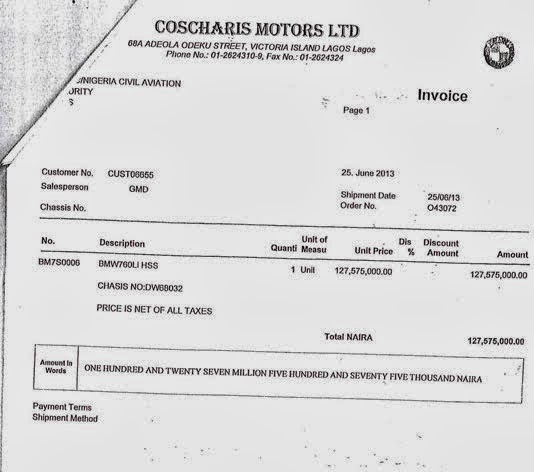 In a letter dated August 13, 2013, J.D Nkemakolam of the NCAA sent a letter to the Managing Director of Coscharis Motors asking the company to deliver to the NCAA two BMW 760 armored vehicles based on a pro-forma invoice dated June 25, 2013 at the cost of N127, 575,000 ($796,846.21) each. 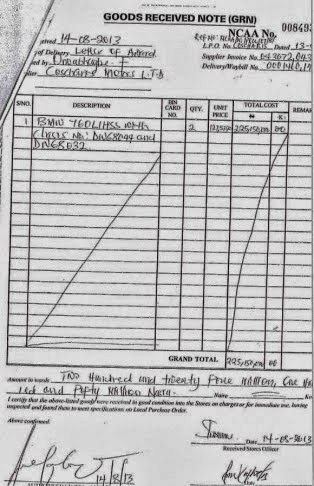 The total amount for the two vehicles came to N255,150,000, or $1,593,687.31. 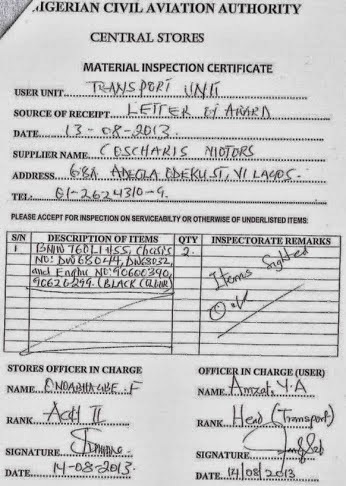 The NCAA’s letter directed Coscharis Motors to deliver the vehicles with sales invoices, delivery notes, and attestation documents. 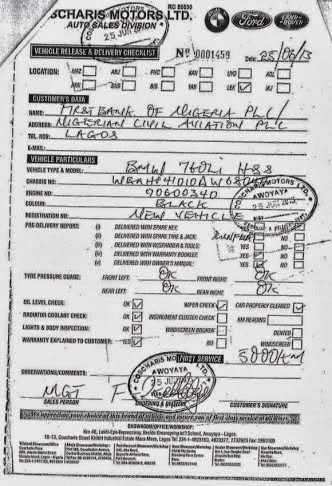 Our documents reveal that the payment for the vehicles was made into a First Bank of Nigeria account (number 2018912995 with sort code: 0111152303), according to a letter signed by Godwin Umeaka, Coscharis’ group financial controller. 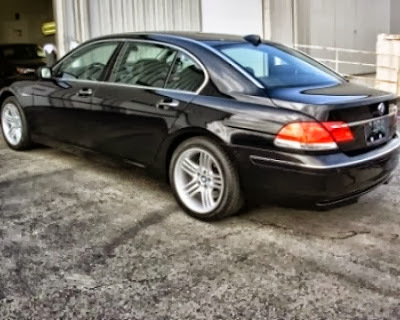 The two black BMW Li HSS vehicles had chases numbers WBAHP41050DW68032 and WBAHP41010DW68044 respectively. The two cars were delivered to the NCAA on August 13, 2013, where it was received by two store managers, F. Onoabhagbe and Y.A. Amzat (who is also the agency’s head of transport). On August 15, 2013, Sola Ogunsakin of the NCAA signed off to certify completion of the transaction. 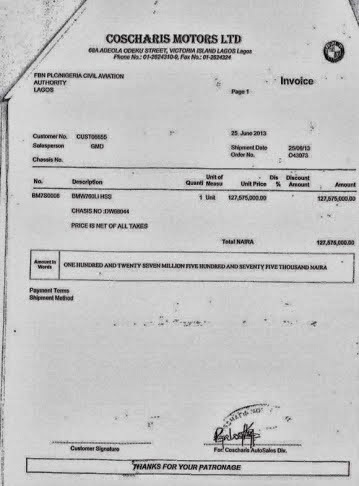 In an extensive investigation of the Aviation sector after three air mishaps in Nigeria’s airspace, SaharaReporters found a pattern of questionable expenditures authorized by the minister. Several insiders within the aviationindustry have told SaharaReporters that Ms. Oduah and President Goodluck Jonathan had focused on theAviation Ministry as a source for a series of corrupt activities. “Under Mrs. Oduah, the ministry has carried out many big capital development projects. But what outsiders don’t know is that these projects are being used to divert big amounts into private pockets,” an aviation source said. Our sources disclosed that the Economic and Financial Crimes Commission (EFCC) had investigated several corrupt practices in the aviation sector, but added that the anti-corruption agency never had the backbone to act on their findings due to political pressure from the Presidency. Several sources at the agency told SaharaReporters that they were not aware of the whereabouts of the twoBMW cars. Some of the sources stated that the cars were handed to the minister who had converted them to private use. Several interest groups have been demanding the removal of Ms. Oduah, citing her corrupt tendencies, mismanagement of aviation funds and incompetence. Under her watch, the Nigerian airspace has witnessed several air mishaps that claimed the lives of at least 140 people. 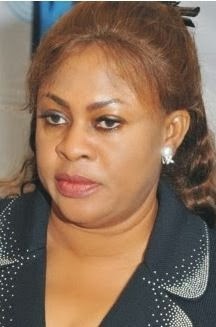 A Presidency source told SaharaReporters that Ms. Oduah still retains the confidence of President Jonathan. She is a close associate of Mr. Jonathan, serving as the treasurer who handled funds for the Jonathan campaign during the 2011 presidential election. She also co-chaired the campaign group known as Neighbor-To-Neighbor.